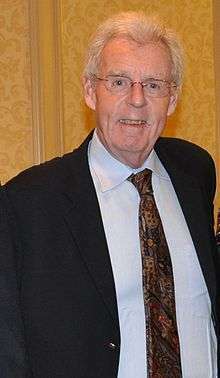 Peter Gammons (born April 9, 1945) is an American sportswriter, media personality, and a recipient of the J. G. Taylor Spink Award for outstanding baseball writing, given by the Baseball Writers Association of America. Gammons went to Groton School, an elite prep school in his hometown, Groton, MA. After graduating from Groton in 1965, he attended the University of North Carolina at Chapel Hill where he was a member of St. Anthony Hall. He worked for the university's student-run newspaper, The Daily Tar Heel, and the student-run radio station, WXYC. After graduating in 1969, he began his journalism career at The Boston Globe. Gammons was a featured writer at The Boston Globe for many years as the main journalist covering the Boston Red Sox. (1969–1975, 1978–1986), or as a national baseball columnist. For many years he was a colleague of other legendary Globe sports writers Will McDonough, Bob Ryan, and Leigh Montville. Between his two stints as a baseball columnist with the Globe, he was lead baseball columnist for Sports Illustrated (1976–78, 1986–90), where he covered baseball, hockey, and college basketball. Gammons also wrote a column for The Sporting News in the 1980s. Gammons has also authored numerous baseball books, including Beyond the Sixth Game. In 1988, he joined ESPN, where he served primarily as an in-studio analyst. During the baseball season, he appeared nightly on Baseball Tonight and had regular spots on SportsCenter, ESPNEWS and ESPN Radio. He wrote an Insider column for ESPN.com and also wrote for ESPN The Magazine. The Globe reprinted some of his ESPN columns well into the 1990s. In 2006, Gammons was named as one of two field-level reporters for ESPN's Sunday Night Baseball, joining Bonnie Bernstein. He held that position through the 2008 season, when he moved exclusively to baseball. After 20 years with ESPN, on December 8, 2009, Gammons announced that he would leave ESPN to pursue "new challenges" and a "less demanding schedule". Gammons joined the MLB Network and MLB.com as on-air and online analyst. He also works for NESN. Gammons is on the 10-person voting panel for the Fielding Bible Awards, an alternative to the Gold Glove Awards in Major League Baseball. He was voted the National Sportswriter of the Year in 1989, 1990 and 1993 by the National Sportscasters and Sportswriters Association. He has also been awarded an honorary Poynter Fellow from Yale University. January 9, 2009 was proclaimed Peter Gammons day in the City of Boston. The proclamation was made by Michael Ross, president of the Boston City Council at the Hot Stove Cool Music Sports Roundtable at Fenway Park. 2010 marked the 10th anniversary of Hot Stove Cool Music, a charitable concert benefiting the Foundation To Be Named Later. At this event, Theo Epstein, Vice President and General Manager of the Boston Red Sox, announced a new scholarship in Gammons' name. The "Peter Gammons - Foundation To Be Named Later Scholarship presented by RISO" enables select Boston Public Schools students to attend college who otherwise might not have the chance. Gammons was born in Boston and raised in Groton, Massachusetts, where he graduated from Groton School. He lives in Boston, Massachusetts and Cape Cod, Massachusetts with his wife Gloria. On June 27, 2006, Gammons was stricken with the rupture of a brain aneurysm in the morning near his home on Cape Cod, Massachusetts. He was initially rushed to Falmouth Hospital before being airlifted to Brigham and Women's Hospital in Boston. At Brigham and Women's Hospital, Gammons' operation was performed by neurosurgeon Dr. Arthur Day who was a friend to late Red Sox hitter Ted Williams. Sportswriter Bob Ryan of The Boston Globe reported that Gammons was expected to be in intensive care for 10 to 12 days. He was resting in intensive care following the operation, and doctors listed him in "good" condition the following day. On July 17, he was released from the hospital and entered the Rehabilitation Hospital of the Cape and Islands. On August 19, Gammons made his first public appearance since the aneurysm rupture at Fenway Park when the Red Sox played the Yankees. Gammons has a penchant for indie rock and the blues, and is active in the Boston indie rock scene when his other commitments allow him the time; he has been sighted at several Midnight Oil shows, and has mentioned the band in several columns. He is also a fan of Pearl Jam, as he has talked about experiences at concerts as well as previous albums (as heard on various ESPN Radio shows.) With the assistance of a band of Boston musicians and former Boston Red Sox General Manager Theo Epstein, Gammons plays a Fender Stratocaster and sings at the annual Hot Stove, Cool Music concert event to benefit Theo and Paul Epstein's Foundation To Be Named Later, a charity that raises funds and awareness for non-profit agencies serving disadvantaged youth in the Greater Boston area. The Boston Baseball Band wrote a song about Gammons called "Jammin' With Peter Gammons." Gammons founded the Hot Stove Cool Music benefit concert series with sportswriter Jeff Horrigan, Casey Riddles, Debbi Wrobleski, Mindy d'Arbeloff and singer Kay Hanley in December 2000. The fundraiser now takes place twice each year, with one show in January and another in July or August. Gammons is tightly connected to the Boston rock scene. He even served as minister at the November 2007 marriage of bassist Ed Valauskas (Gravel Pit, the Gentlemen) and singer Jennifer D'Angora (Downbeat 5, the Dents, Jenny Dee and the Deelinquents). 1 2 3 "Gammons in ICU after surgery for brain aneurysm". ESPN.com. 2006-06-28. Retrieved 2006-07-19. 1 2 Ryan, Bob (2006-06-27). "Gammons stricken, undergoes surgery". The Boston Globe. Retrieved 2006-07-19. ↑ "Peter Gammons leaving ESPN baseball after 20 years". ESPN.com. 2009-12-08. Retrieved 2009-12-08. ↑ "Peter Gammons to leave ESPN for MLB Network". MLB.com. 2009-12-08. Retrieved 2009-12-08. ↑ Gleeman, Aaron (November 1, 2010). "Yadier Molina leads fifth annual "Fielding Bible Awards"". NBCSports.com. Retrieved November 18, 2010. Voted on by a 10-person panel that includes Bill James, Peter Gammons, Joe Posnanski, Rob Neyer, and John Dewan as well as the entire video scouting team at Baseball Info Solutions, the award sets out to recognize the best defensive player at each position, regardless of league. ↑ "Peter Gammons Blog". ESPN.com. Retrieved 2009-12-08. ↑ "RISO Contributes to the Peter Gammons Scholarship Fund". RISO. Business Wire. 12 January 2010. Retrieved 2010-01-17. ↑ "'One of the luckiest people on the earth' - MLB - ESPN". Insider.espn.go.com. 2006-09-19. Retrieved 2012-12-16. ↑ "Gammons out of hospital, heads to rehab center". ESPN.com. 2006-07-18. Retrieved 2006-07-19. ↑ "Gammons Watches Game at Fenway Park". Washington Post. 2006-08-20. Retrieved 2006-08-21. ↑ "Gammons returning to ESPN air". ESPN. 2006-09-19. Retrieved 2006-09-19.